City Barge rows unusual boats in Oxford, and elsewhere, and enjoys social events connected with rowing for pleasure. Our different groups of rowers and supporters overlap, intermingle, and have fun. This is a very flexible style in which rowers stand up, face forwards and see where they are going. Crews can vary from one to eighteen, but four is the most common. The club owns six Venetian boats and members own a further fifteen making probably the largest collection of Venetian boats outside Italy. City Barge’s Venetian rowers are a very active group of about 30 members. They take part in weekly outings on Saturday mornings in Oxford. Some members travel to Venice each year, in May, to take part in the ”Vogalonga”, a 32 kilometre rally around the Venice lagoon, ending in a triumphant leg along the Grand Canal. The best way to start is to come to one of our Saturday morning outings and have a go. We teach Venetian rowing to complete beginners. You will learn more quickly if you have experience of handling small boats and have reasonable balance and fitness, but this is not essential. We offer a couple of sessions free to see if you like the experience. If you sign up for full membership you can continue rowing accompanied by other members. The more you come to row the easier it will become. When you are competent enough you’ll be able come on outings to other locations. If you advance further, you will be given access to club boats to row on your own, at times to suit yourself. 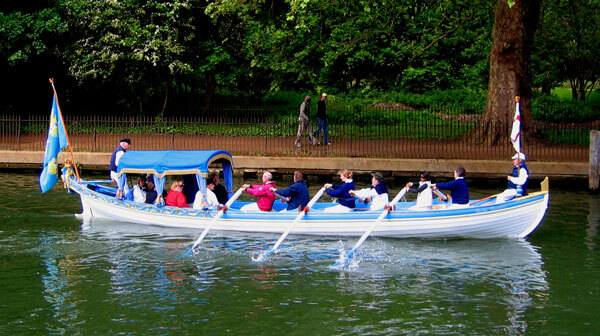 Come and start with Venetian rowing tuition. The “Standing Captain” runs the activities of this group helped by the “Ladies Standing Captain”. The club rows a six-oared ceremonial rowing boat called a shallop. She is a replica of Queen Mary’s barge of 1689 and is owned by the Drapers Guild in London, but stored near Oxford, and operated by City Barge. It is crewed by six sitting rowers on fixed seats, a cox at the rear, and a whiffler at the front. Shallop outings are usually ceremonial parades, and provide opportunities to row something splendid and unusual at exciting public events. Outings include the Tudor Pull (London), Henley Royal Regatta, Countryside Live (London), and the Lord Mayors Flotilla (London). The shallop is a sight to see on the water and is much admired at special events. Extra crew for the shallop are always welcome. 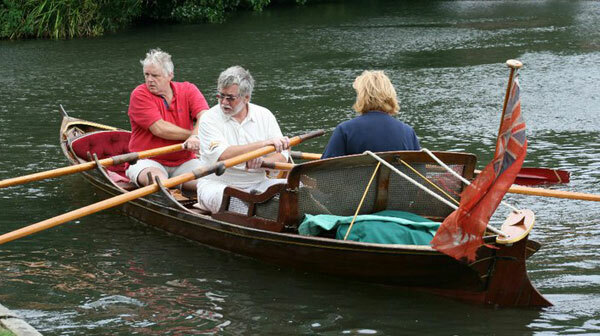 The club expects those wishing to row in the shallop to have some experience of conventional rowing. There are some training outings each year to improve rowing as a crew, and to practice operating the boat safely. Working together with good technique is important to compliment the appearance of this graceful vessel. To find when you could be involved in an outing: contact the “Bargemaster”, who is a member of our committee and a liveryman of the Draper’s Company. Our conventional style rowers use boats such as skiffs and gigs. They row mainly for pleasure, rather than racing and many of them have their own boats. We have to two gigs at Oxford. One is a club boat “The Whiffler”, and the other is on loan from a member. 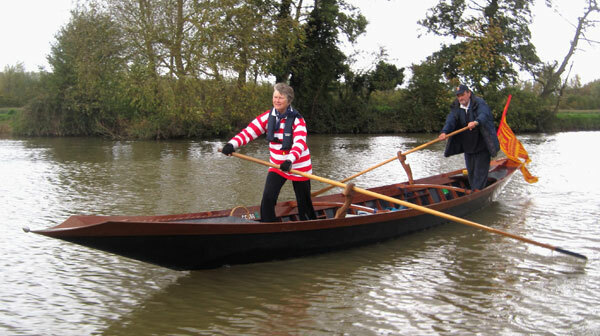 English style rowers come on trips to other rivers, canals, and lakes, which are social outings. A key event in the club year for sitting rowers is a downstream row, on the Thames, from Lechlade to Henley or Benson, taking several days. Venetian boats also take part. Some conventional rowers join the annual trip to Venice for the Vogalonga, usually borrowing a sliding-seat coxed four from a sister club in Venice called “Querini”, one of three Venetian rowing clubs we are associated with. Members using their own boats, and not using club equipment or rowing in loaned members boats, can join the club at the supporters subscription rate which is lower than the full membership rate. This group is co-ordinated by the “Sitting Captain”. Go to How to Join for an application form. We have some events which are purely social or cultural in nature. These include our AGM in February and our Christmas dinner in December. We have visited galleries such as the National Portrait Gallery, and have viewed Canaletto paintings in various locations. Supporters accompany us on our major trip to the Vogalonga in Venice in May, and this group of supporters and rowers usually numbers about 30. 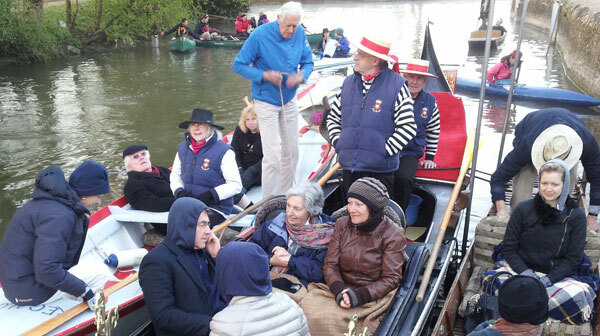 We have events where passengers are welcome in our boats, for example viewing the racing at Henley Royal Regatta and a very early outing each May Morning in Oxford. We listen to singing from Magdalen College tower at 6am on the river Cherwell, and then retire for breakfast with home-made marmalade in the clubroom above our boathouse. To become a social member please consult How to Join and enrole as a supporter. Supporters are listed on our membership list and are kept informed by email of all our activities.